Dark Bronze Seamless Flanged cover, w/ Dual Flip Lid & Duplex Mount. Plt. The Lew Electric TCP-2-LR-DB is a seamless bronze cover and flange. The cover features dual flip lids to gain access to the duplex outlet opening inside of the floor box. 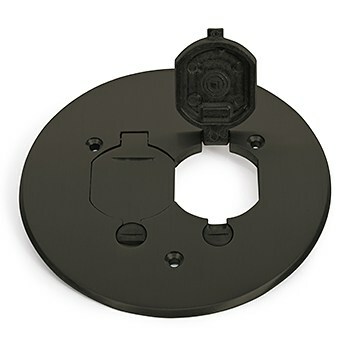 The cover comes with the duplex mounting plate, rubber gasket, and plate screws.